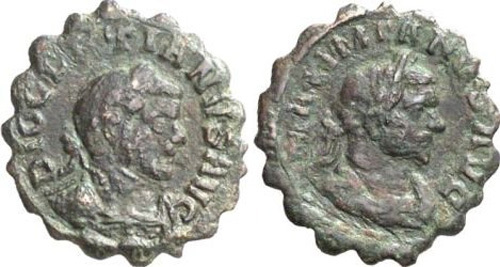 In 285, Diocletian became undisputed master of the Empire, but as the attacks of the barbarians became daily more formidable, he resolved to associate himself a colleague in the Empire, and accordingly selected for that purpose Maximianus, who was invested with the title of Augustus in 286. Obverse: DIOCLETIANVS AVG, Laureate, draped and cuirassed bust right. Reverse: MAXIMIANVS AVG, Laureate, draped and cuirassed bust right.